The Veterans' Memorial of Wake Forest pays tribute to Veterans from the Wake Forest community who served in war and died defending our freedom. Such a monument has been long overdue and creates an awareness of those who should be honored so highly for giving their lives for our freedom. The Veterans' Memorial has a vision to preserve, for present and future generations, the meaning and lessons behind these special members of our community. We recognize that intergenerational awareness to continue to appreciate these individuals will depend upon education. Hence, the mission will be met by a perpetual maintenance fund to sponsor innovative commemorations and educational programs that foster an awareness of the historical significance of this monument. 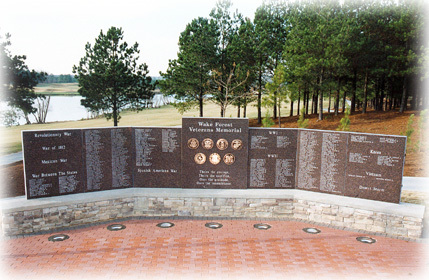 The Veterans' Memorial of Wake Forest is a non-profit corporation registered in North Carolina. © 2002 Veterans' Memorial of Wake Forest, NC, Inc.